Dr. Braddock, a board certified internist, is Vice Dean for Education in the David Geffen School of Medicine at the University of California, Los Angeles (UCLA). He is also Chief Medical Education Officer for UCLA Health, and holds the Maxine and Eugene Rosenfeld Chair in Medical Education. In this position, he oversees all aspects of medical education, including undergraduate, graduate and postgraduate medical programs. This structure reflects Dr. Braddock’s vision of the medical education continuum, with a seamless connection between competencies and ongoing professional development across all phases of training and practice. Prior to this appointment, he served as Professor of Medicine and Associate Dean for Undergraduate and Graduate Medical Education at Stanford University School of Medicine, and was the Founding Director of the Stanford Center for Medical Education Research and Innovation. He is Chair of the Board of Directors of the American Board of Internal Medicine, and Chair of the Executive Compensation Committee. Dr. Braddock has served as Chair of the Ethics Committee and Council for the Society of General Internal Medicine and on the Ethics, Professionalism and Human Rights Committee for the American College of Physicians. He is a Master in the American College of Physicians. 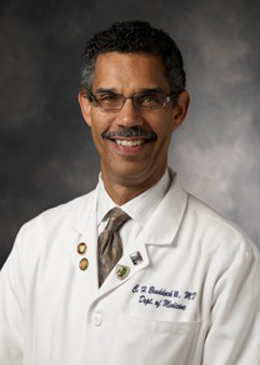 Dr. Braddock earned his undergraduate degree at Stanford University and medical degree at the University of Chicago. He completed residency training in the U.S. Navy and completed a general medicine fellowship and master’s in public health degree in health care ethics at the University of Washington.